Which are the best Barcelona beaches? 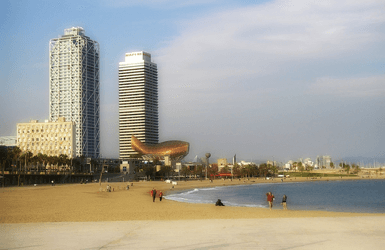 Home » WHICH ARE THE BEST BARCELONA BEACHES? Undoubtedly, one of the major attractions of Barcelona city is the sea and, of course, the beaches. Everybody knows that the combination of sun and sea is the guarantee of a good day. But, how do you decide a beach in a sunny day? We want to help you to find the best beach in Barcelona that suits your needs. Located at the end of the Barceloneta fishermen district, this is the oldest beach in town, and one of the most popular. It is also one of the longest in the city: more than 1.000 meters long. There’s an area for people with handicap where volunteers might help them with an amphibious chair to enjoy the sea. Next to the Sant Sebastià beach and part of La Barceloneta quarter, this is also one of the oldest beaches of the city. It’s frequented by tourists and school groups practicing watersports. In windy days, it’s where people gathers to practice windsurf and kite surfing. It’s also popular for its chiringuitos (beach bars). During the years before the 1992 Olympic Games a huge project transformed the waterfront to open Barcelona to the sea. This beach is one of the results. Located in the Sant Martí district, it is about 700 meters long and very easy to reach by subway (stop at Ciutadella – Vila Olímpica, on the L4). 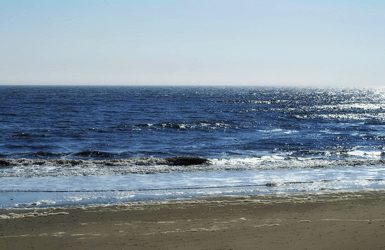 This beach is perfect for families or groups of friends, as it is considered one of the quietest beaches in the city. Next to the Port Olimpic, is the best option if you want to relax, plus there are plenty of food options around (check out here our favorite Barcelona beach restaurants). It’s not too far from the subway either. It is also adapted for handicapped. Just a bit further, this beach was also created during the refurbishment project of the Olympic Games. It’s probably the most diverse and cosmopolitan beach, frequented by young people, mostly students from the nearest universities, and women living in the district. There’s an area adapted for handicapped people., with adapted showers and toilets. AND BONUS! The areas of the beaches in Barcelona that are frequented by nudists! Top-less and nudism are legal in Spain. 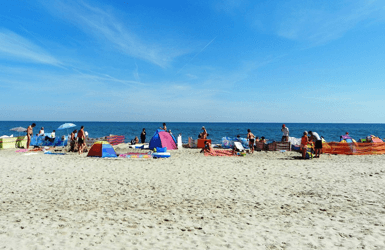 And while you’ll find ladies of all ages happily sunbathing their naked breasts in any city beach, there are two beaches in Barcelona with specific areas frequented by nudist (but they are not nudist-only: nudist and non-nudist mix in naturally there). The Sant Sebastià beach, probably because of its isolated location before the construction of the W Hotel, has been the favorite of gay nudists for many years. Instead, in the Mar Bella beach you will mostly find families that enjoy not using any swimsuits at all (Attention: don’t confuse Mar Bella with NOVA Mar Bella, right next to it). So what about you? Head to the comments below and tells us: what’s your favorite Barcelona beach?